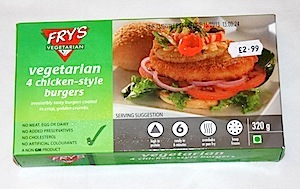 A pack of 4 chicken style vegetarian burgers from Frys Vegetarian. Frys have been really busy expanding their range recently and these chicken style burgers are another great choice from Frys. The breadcrumb outer is crispy and lightly spiced and the vegetable protein made with soya and wheat has a savoury flavour. I have no idea if they taste like chicken but they do taste pleasant. Perfect on a bun with some ketchup and salad leaves, and great with some chips. Each 320gram pack of 4 burgers are suitable for vegans and vegetarians. No Cholesterol, No Meat, No Egg, No Dairy. Per burger is 135kcal. Sold in the freezer section of health food shops, I have seen them in independent health food shops and big chains like Holland & Barret. A Caribbean curry cooking sauce from the Levis Roots range. You can use this for any vegetables or beans or pulses like chickpeas. I used it to make a simple chickpea curry. I have to admit that despite some other Levis Roots products being very good, I did not enjoy this sauce. It was very very hot and spicy and the flavour for me was not like the usual curry where the flavours come through. It just needs to be toned down a bit. I like hot spicy food, but this one for me just does not work. 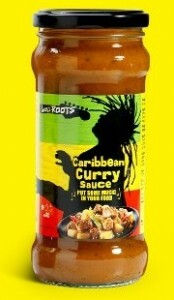 Each 350gram jar of curry sauce is suitable for vegans and vegetarians. Made with Scotch Bonnet Chillies. Per 100grams is 104kcal. Sold in supermarkets. I bought mine in Tesco.